Italian Spider-Man Comic with TV Spider-Man on the cover- There is so little merchandise for TV Spider-Man (aka one of my obsessions) that little things like this bring me joy. Ultraman Halloween Costume- I love Ultraman but I don't have a lot of his merch, one of my breaking points would be toys that were marketed to North American kids when he was syndicated in the early 1970s. I proudly own one of these costumes but rarely do i wear it. Farrah Fawcett Poster Art Set- If these things weren't gigantic, they would be all over my house. As it stands i own two sets. They just hit every nostalgia button for me. 1982 HERVE VILLECHAIZE SIGNED HAND PRINTS & FEET IN CONCRETE- I don't have the money for this (heck i currently don't think I could afford the shipping) but I love that he drew a little caricature of himself at the bottom. My jaw is dropping open at the Herve Villechaize concrete. What an unbelievable piece!!! It would be funny to color the Farrah poster in a public place and tell people it's a therapeutic coloring book. Nice to see the artist retained important details from the iconic poster. ^Yeah, I was looking to see if he...AND YEP...there they are! It'd be worth buying that Herve Villechaize concrete just to walk into my local framers to discuss framing options. What a wonderful random assortment of coolness this week! I don't have the money for this (heck i currently don't think I could afford the shipping) but I love that he drew a little caricature of himself at the bottom. Please don't have this sent to my office, there would be sooooo many awkward questions to answer. I won part of the Megabug lot and completed my collection. I'm thrilled, as the dragonfly is difficult to obtain. I think Megabug Gladiators is a terrific, underrated, little-known line. I pined for a wave 2 even as a kid. Last edited by PNGwynne; Feb 8, '19 at 7:03 PM. I had the scorpion until a few years ago. 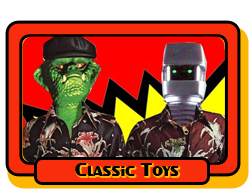 Could never remember the toy line name. I have a set of Lego Star Wars, I want to buy a compatible LED light, does anyone know where to buy it?